Kwanzaa is celebrated from December 26 to January 1. It is a holiday that honors African culture and history. 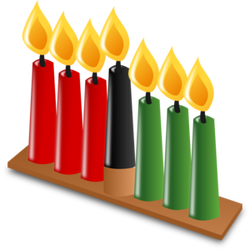 There are 7 candles that represent the 7 principles of Kwanzaa. The biggest celebration night is December 31. Families gather to celebrate with a big feast.